The Paleocene epoch of geological time is the first epoch of the Cenozoic 'age of mammals.' Originally part of the Eocene, it was separated because of its distinctively more primitive flora and vertebrate fauna. Now, in a nutshell, the Paleocene represents the time between the extinction of dinosaurs and the first appearance of horses. For vertebrate paleontologists, the appearance of horses (order Perissodactyla) has long been taken to define the beginning of the Eocene. The Paleocene-Eocene transition is important for more than horses— many of the modern orders of mammals make their first appearance in the fossil record at this boundary. My research on the Paleocene-Eocene boundary and the Paleocene-Eocene evolutionary transition started in the 1970s when I started as a professor at the University of Michigan. In broadest terms, my objective was to understand the origin of modern orders of mammals. I was especially interested in modern Primates on one hand, and Perissodactyla on the other, and I thought that more detailed documentation of the biostratigraphy of mammals crossing the Paleocene-Eocene boundary might clarify both the origin of primates and the origin of perissodactyls. The first step was to recollect and restudy the latest-Paleocene Clarkforkian land-mammal age in its type area, the Clarks Fork Basin of northwestern Wyoming (green localities in the northwestern part of Fig. 1). The Clarkforkian fauna was the subject of Kenneth Rose's Ph.D. dissertation at Michigan (Rose, 1981: 11-Mb pdf) . Figure 1. 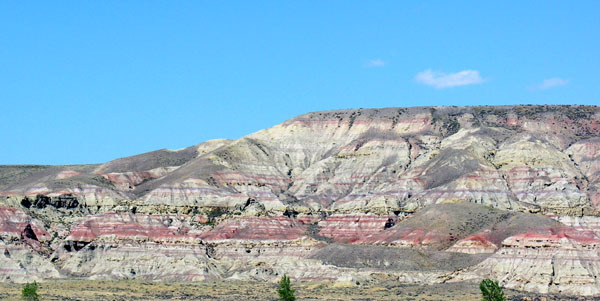 University of Michigan and other Paleocene and early Eocene fossil localities in the Clarks Fork and Bighorn basins of northwestern Wyoming. Polecat Bench (PB) is a Pleistocene river terrace on the divide between the two basins. Tfu is Paleocene Fort Union Formation; Twl is upper Paleocene and lower Eocene Willwood Formation. Blue localities are Tiffanian; green localities are Clarkforkian, and red to yellow localities represent the Wasatchian land-mammal age. Red stars are localities with Wa-0 faunas in the Paleocene-Eocene thermal maximum or PETM interval. Stable isotope studies have been published or are underway at PETM interval localities labeled PB, MB, HC, CF, and CC. Map ©2006 Philip Gingerich. Figure may be reproduced for non-profit educational use. In the process of making the new collections required for the Clarkforkian study, we were able to map a narrow interval of strata that contained the earliest North American horses (Hyracotherium sandrae, named for graduate student Sandra Carlson who found a partial skeleton of this species); the earliest North American primates (Cantius torresi and Teilhardina brandti, named for graduate students Victor Torres and Carrie Brandt who found the type specimens of each species); and the earliest North American artiodactyl (Diacodexis ilicis, named for graduate student Holly Smith who found the type specimen of this). I summarized what was known at the time about earliest Eocene mammals of the Bighorn and Clarks Fork basins of northwestern Wyoming in a monograph on what I called the 'Wasatchian zone zero' or Wa-0 mammal fauna (Gingerich, 1989: 9-Mb pdf). The richest locality was University of Michigan locality SC-67 at the south end of Polecat Bench, on the divide between the contiguous Clarks Fork and Bighorn basins. Figure 2. University of Michigan fossil localities at the south end of Polecat Bench. Lower drab sandstones and mudstones yield Clarkforkian latest Paleocene mammals. Thirty meter thick bright red interval yields Wa-0 mammals. Upper drab sandstones and mudstones yield Wasatchian early Eocene mammals. 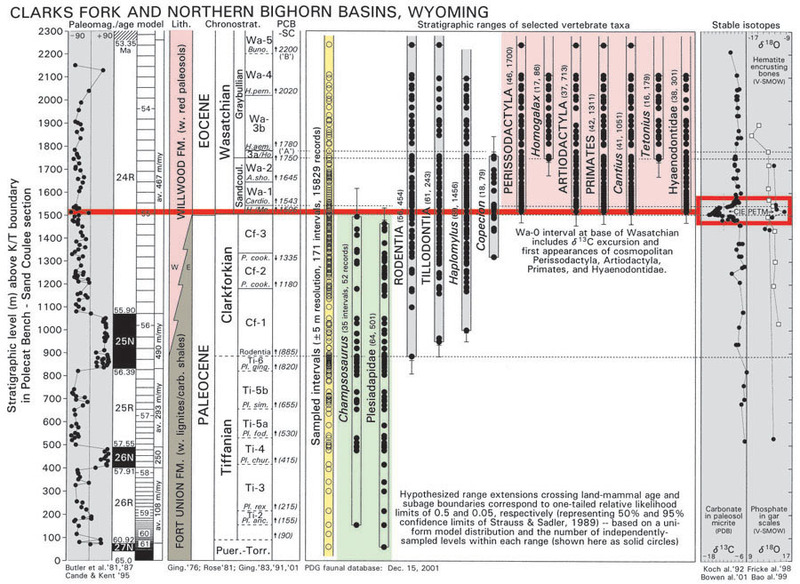 Note the excellent exposure and lateral persistence of fossil beds. Photograph ©2006 Philip Gingerich. Figure may be reproduced for non-profit educational use. 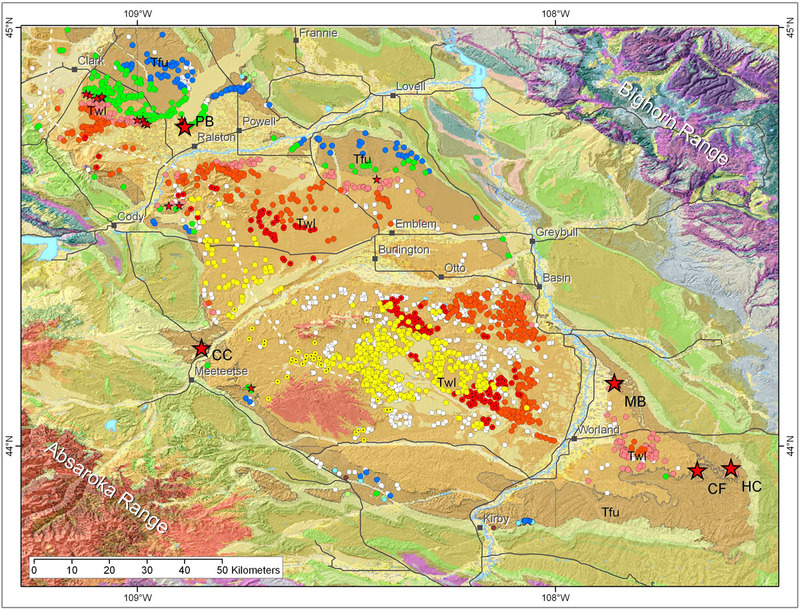 The Wa-0 monograph showed that: (1) Wa-0 mammals are found in a narrow 30 meter-thick stratigraphic interval that has unusually mature red paleosols (30 m out of ca. 2200 m of upper Paleocene and lower Eocene section); (2) the first North American artiodactyls, perissodactyls, primates, and hyaenodontid creodonts (so-called APP or APPH taxa) made their first appearance together in this narrow interval; (3) the Wa-0 fauna included the first APPH taxa, but overall it was intermediate in proportional representation of taxa between older Clarkforkian and younger Wasatchian faunas; and, finally, (4) the fauna included several species smaller than older and younger congeners that are seemingly dwarfed by comparison. Ectocion parvus, named by Granger in 1915 for a specimen found at Polecat Bench, is the best documented example of dwarfing in the Wa-0 interval. The 1989 Wa-0 monograph raised many questions: (1) why is the interval so red? (2) why do the new taxa all come in together at this particular time? (3) why are faunal proportions intermediate if one fauna replaced another? and (4) why are some species seemingly dwarfed in this interval? These questions were on the table with no clear prospect for answers. Figure 3. Summary of mammalian faunal change before, during, and after the carbon isotope excursion (CIE; red line) marking the Paleocene-Eocene thermal maximum (PETM) interval in the vicinity of Polecat Bench in northwestern Wyoming. Paleomagnetic chronology and isotope samples are from the same stratigraphic section as the faunal results. Age model at left (100 kyr boxes) and sediment accumulation rates are derived from a cubic spline fit sediment accumulation to ages inferred for the tops and bottoms of magnetochrons. Clarkforkian is marked by the first appearance of Rodentia, and the Wasatchian is marked by the first appearance of Perissodactyla. Paleocene-Eocene boundary is now defined as the onset of the CIE in a marine section at Dababiya in Egypt. Diagram ©2006 Philip Gingerich. Figure may be reproduced for non-profit educational use. Progress came faster than expected when former graduate student Paul Koch made a survey of carbon and oxygen isotopic ratios through the late Paleocene and early Eocene on Polecat Bench, and found anomalously light carbon in the Wa-0 interval at locality SC-67 (Koch et al., 1992). This isotopic anomaly meant something right away because it was in the interval with the anomalous Wa-0 fauna. James C. Zachos was a postdoctoral fellow at Michigan at the time and quickly made the connection to a light δ13C anomaly described by Lowell Stott et al. (1990). Thus very quickly the Paleocene-Eocene boundary on land was tied to the Paleocene-Eocene boundary in the world's oceans, and biotic events at the boundary could be tied to what came to be known as the Paleocene-Eocene Thermal Maximum or 'PETM.' The PETM is recognized around the world by its negative δ13C carbon isotope excursion or 'CIE' signature. High-resolution CIE shown in red in Figure 3 is from (Bowen et al., 2001). Ongoing Paleocene-Eocene transition research at Polecat Bench and elsewhere in the Bighorn Basin is summarized in the following publications. Bloch, J. I. 2001. Mammalian paleontology of freshwater limestones from the Paleocene-Eocene of the Clarks Fork Basin, Wyoming. Ph.D. dissertation, University of Michigan, Ann Arbor, 358. Clyde, W. C. 1997. Stratigraphy and mammalian paleontology of the McCullough Peaks, northern Bighorn Basin, Wyoming: implications for biochronology, basin development, and community reorganization across the Paleocene-Eocene boundary. Ph.D. dissertation, University of Michigan, Ann Arbor, 270. Gunnell, G. F. 1998. Mammalian faunal composition and the Paleocene-Eocene epoch/series boundary: evidence from the northern Bighorn Basin, Wyoming. In M.-P. Aubry, S. G. Lucas, and W. A. Berggren (eds. ), Late Paleocene-early Eocene climatic and biotic events in the marine and terrestrial records, Columbia University Press, New York, pp. 409-427. Hartman, J. H. and B. Roth. 1998. Late Paleocene and early Eocene nonmarine molluscan faunal change in the Bighorn Basin, northwestern Wyoming and south-central Montana. In M.-P. Aubry, S. G. Lucas, and W. A. Berggren (eds. ), Late Paleocene-early Eocene climatic and biotic events in the marine and terrestrial records, Columbia University Press, New York, pp. 323-379. Strait, S. G. 2001. New Wa-0 mammalian fauna from Castle Gardens in the southeastern Bighorn Basin. In P. D. Gingerich (ed. ), Paleocene-Eocene stratigraphy and biotic change in the Bighorn and Clarks Fork basins, Wyoming, University of Michigan Papers on Paleontology, 33: 127-143. This research has been funded by the U. S. National Science Foundation, the Petroleum Research Fund of the American Chemical Society, and the University of Michigan. Any opinions, findings, and conclusions or recommendations expressed on this web page are those of the author and do not necessarily reflect the views of the National Science Foundation, the American Chemical Society, or the University of Michigan. Page updated 12/27/10 : Comment?